In 1931, James Cagney helped jump-start the gangster genre as THE PUBLIC ENEMY. In 1935, he waged on-screen war against the nation's public enemies. 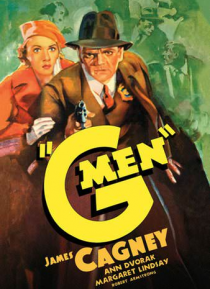 Outcries against movies that glorified underworld criminals put Cagney on the side of the law in "G" MEN. Emphasis may have changed but elements are the same. "G" MEN builds to a fury of bold escapes, siren-wailing pursuits and frenzied shootouts. Her… e, a punchy hot-off-the-presses account of the pursuit and capture of John Dillinger provides the story inspiration as tough-guy Cagney and gives it to 'em good in a movie.